Circular, single-stranded DNA genome of approximately 1,350 nucleotides that have no sequence identity to their helper begomoviruses. Contains an adenine rich region, and a satellite conserved region (SCR). 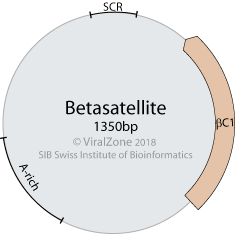 The betasatellites depend on their helper viruses for replication. The genome encodes an approximately 13.5-kDa protein known as beta-C1.